On Sunday, August 25, 2013, members from the local barns, Chestnut Hill, Courtesy and Monsatery Stable met for the monthly fun day of Horses in the Park. Local visitors to the Wissahickon Creek stop by & love to see, pet & marvel at the horses. One person actually called the barn at around 11 to see what time we were going to be there. Both kids & adults love the horses. People profess to learn so much as we explain the horses perception of visibility and the kids are amazed to learn that a horse has a "frog on his foot!" The Pennsylvania Equine Council's Philly Chapter recently did a ride and raised over $10,000 to help rebuild the warming sheds at Valley Green Inn. The sheds were used in historical times to keep the horses haunches warm while folks frequented the inn for the famous dish of catfish & waffles known in the Wissahickon, a word meaning yellow water. 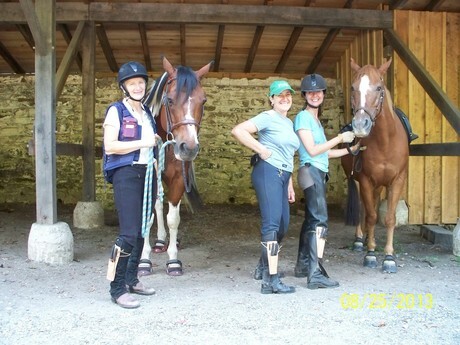 The Philly Chapter has been working closely with the Friends of the Wissahickon & the Philadelphia Department of Parks & Recreation to help maintain & keep trails open to horses. Recently we purchased clippers & sheaths which can be tied to our calves & we clip overhead branches while we ride. Missing from the photo are Friends of the Wissahickon's Henry Stroud, Project Manager & Eric Falk, Volunteer Coordinator (filling the shoes of Kevin Groves, my first mentor). We love you Kevin, Henry & Eric!